While we Star Wars fans salivate over the Star Wars Force Friday II release of new toys, let’s take a quick look back to one of the most popular and colorful Star Wars figures line. This one was called Star Wars Unleashed, which debuted in 2002 and ran until 2007, ten years ago. The line mostly concentrated on the characters from the then-current films Star Wars Episode II: Attack of the Clones and Star Wars Episode III: Revenge of the Sith. 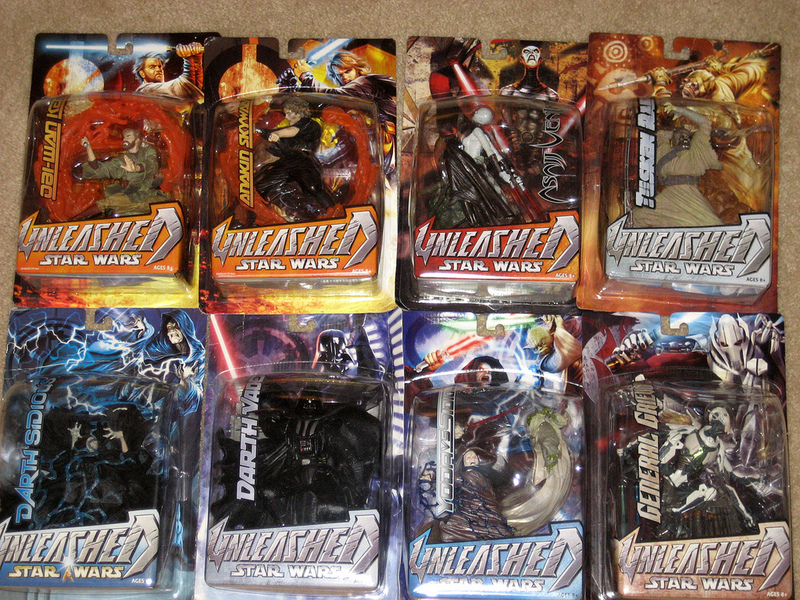 As with recent Star Wars toys, the Star Wars Unleashed line was manufactured by Hasbro and the figures cost more than the standard six-inch figures. Usually they retailed for about $15-$20 and the cost was due to their size, plus the bases of the figures. Those who managed to buy them at the initial price back then are extremely lucky because they now cost quite a lot in the secondary markets. Some fetching prices well into the hundreds of dollars. When the line was first launched, each figure had a theme reflected in their dynamic poses. Each pose represented a key moment for the character in the movie. This was probably to make up for the fact that they’re not as articulate as regular figures though they’re much more detailed. 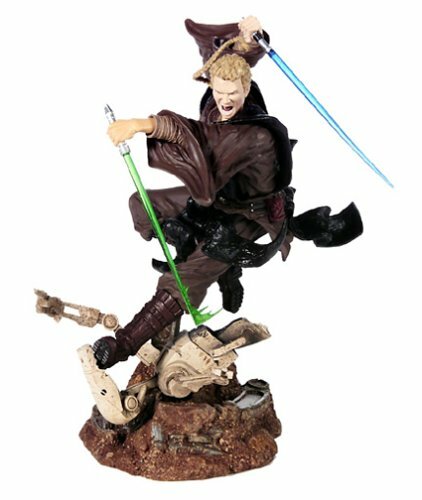 A good example of such vivid posing and sculpture is the Anakin Skywalker figure is known as “Rage” since that the sculpture illustrated his violent mood after his mother was killed in Episode II. We all know after her death Anakin went on a killing spree, which made him reckless, even into his fateful confrontation with Count Dooku. It was one of the most dramatic poses in the series with Anakin in full attack mode wielding two lightsabres and a look of pure hatred. It’s amazing that the manufacturers were so capable of capturing his inner turmoil since one wouldn’t expect that from a toy. The other most dramatic figure that was part of the initial release was the Darth Maul figure that is called “Fury” and he is placed standing on one leg as if ready to pounce on a hapless Jedi as a swirl of red dark force energy swirls around that leg. For some reason, the other figures released in the following years didn’t have any subtitles, which took away from the idea that the sculpture were supposed to represent the characters at certain, pivotal moments. Luckily for the collectors, the later figures in the Star Wars Unleashed line were just as impressive and in fact more so. Take the Boba Fett figure that was sold exclusively at Target. The detailing is simply beautiful and the pose was so dramatic. You almost expect the bounty hunter to come to life. In the actual display, Boba Fett is battling the hungry sarlacc creature while trying to escape. This was inspired by the scene in Star Wars Episode VI: Return of the Jedi when he is eaten by the creature. In this pose it looks as if he’s ready to blast off, implying that he survives the encounter. 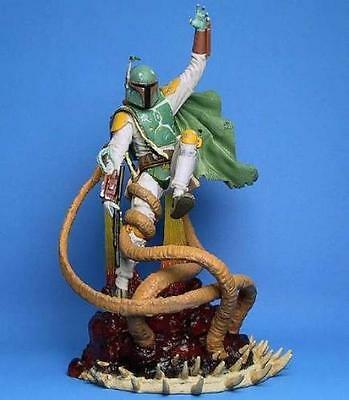 It was a beautiful and dynamic sculpture as Fett’s posture with one arm raised high and one leg tangled in the sarlacc’s tentacle was reminiscent of a cover from an old science fiction pulp magazine. 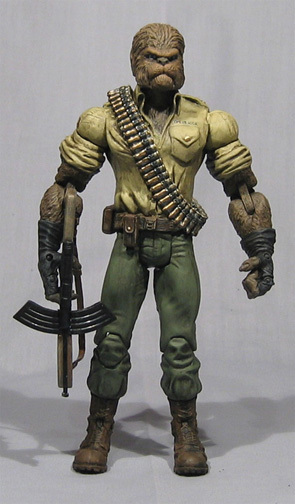 On a side note, additional figures were repackaged and sold exclusively in Wal-Mart, KB Toys, Best Buy and Target. They included two versions of Darth Vader, Luke Skywalker and General Grievous. The figures were slightly larger than the original figures. The best figures from that line included the just-mentioned Darth Maul and Boba Fett, as well as the Yoda (2003), Obi-Wan Kenobi and General Grievous (2005). 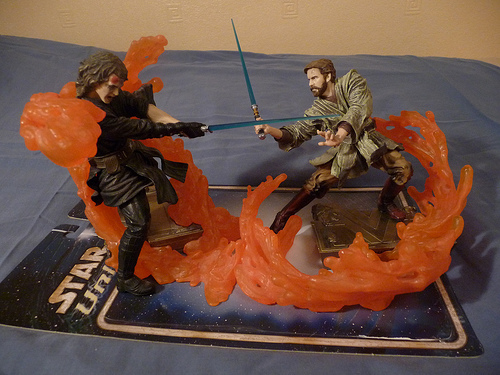 One nifty aspect of the Obi-Wan figure is that he can be easily connected at the base with the Anakin Skywalker figure also released in 2005. Based on the final moments of Star Wars Episode III: Revenge of the Sith, when they confront each other on the volcanic planet Mustafar, they are both shown in battle poses as swirls of lava surround them. Only their mastery of the Force keep the lava at bay. Even though these two figures were sold separately, they could be connected. This idea was carried one step further the same year with the Yoda vs. Palpatine figures that come together in one package. It can be said that Hasbro took this to the next level with the release of the Epic Battles packs collection. These sets sold for less and included at least four figures though they are much smaller, roughly three inches tall. The collection includes groups of Jedi, Wookies, Droids, Imperial Troops and so forth. They were also well detailed with dramatic poses but were not as enticing as the regular Star Wars Unleashed figures, which were more geared for older children and adult collectors. However, they’re perfect for the younger fans who want to recreate exciting scenes from this film series that just seems to spawn more and more creative toys and figures. 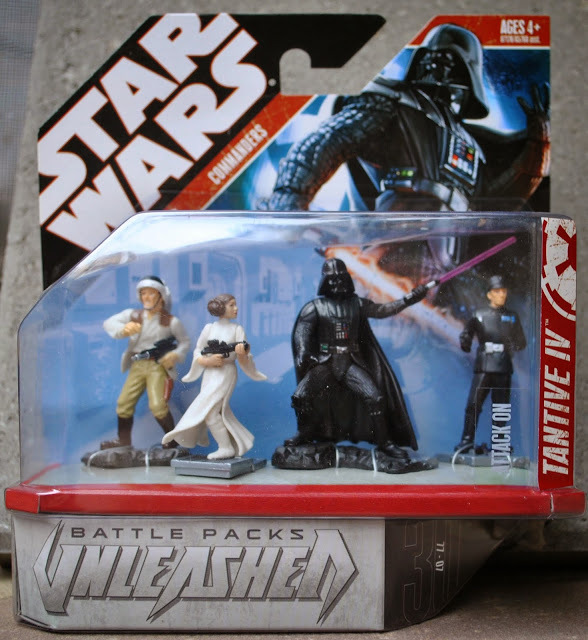 On the other hand, the popularity of the Epic Battle packs spelled the end of Star Wars Unleashed. There was only one Star Wars Unleashed released in 2007, Count Dooku, which was just as masterfully sculpted and detailed as the other figures. It’s a shame that the line ended because there are so many characters that would be perfect. Imagine one being sold for Ahsoka Tano, Rey, Lando Calrissian, Qui-Gon Jinn, or Luke Skywalker from the first Star Wars film. We do have the Titanium and Black Series figures which are just as impressive, but Star Wars Unleashed does hold a special place in my collector’s heart. It’s probably because of the dramatic forces that captured the essence of the characters. Perhaps one day they can come back in some form or another. One popular gift item for the holidays with fans are Star Wars ornaments. Though there are produced by different companies the best ones are those made by Hallmark. They were first produced by Hallmark in 1996 a few years after the success of the Hallmark’s other sci-fi brand the Star Trek ornaments. 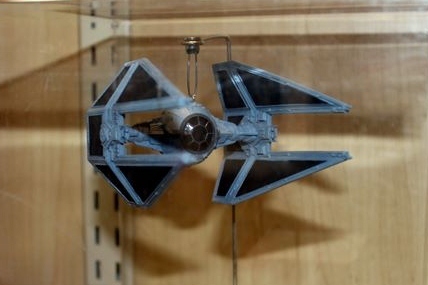 The first beautifully detailed ship ornament was of the Millennium Falcon and in that same year, Hallmark produced a set of mini-ornaments which consisted of a TIE fighter, an X-wing fighter and an AT-AT. Since then, the company has released several ornaments each year and there is no sign of slowing down. Many of these ornaments have become highly sought after in the secondary market like the original R2-D2, while others are duds that would be lucky to fetch a buck on eBay (examples of those include Emperor Palpatine and Princess Leia in her slave outfit). 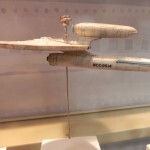 The pattern of these releases per year consists of a strikingly detailed ship, characters and dioramas. The first Star Wars (and Star Trek) ships featured lights but had to be inserted via a wire into a Christmas tree light socket. These days, batteries replaced the wires but for some reason while the Star Trek ships still have light features (except for the NX-01 and the 2012 Enterprise D) the Star Wars ships only have sound features. It’s too bad, because the lights as seen in the Star Trek ships really add an oomph factor and the Star Wars ships seem kind of pale in comparison. The character ornaments look great on trees, even the villains like Darth Vader, and they are much more colorful and eye catching when compared to the Star Trek character ornaments who are basically just humans. With Star Wars, Hallmark wisely utilized the many different aliens and droids in that universe and this could be why the ornaments are so popular. Even the human ornaments are nifty with the same characters being released wearing different outfits or accompanied by exotic companions like the Han Solo ornament with him riding on a tauntaun. The dioramas themselves are usually topnotch. Some include lights and sounds that capture specific moments from the films like Anakin Skywalker’s duel with Obi-Wan Kenobi in Episode III or when the Millennium Falcon leaves Mos Eisley (that diorama boasts John Williams’ iconic score) in Episode IV. Other dioramas were kind of frustrating, take 2011’s recreation of the Han Solo and Greedo confrontation in Episode IV. We still don’t know who fired first! 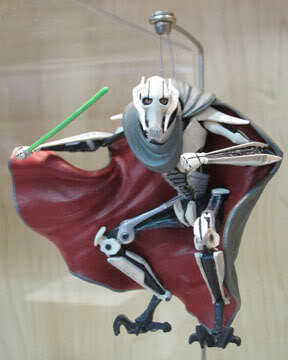 Hallmark also released ornaments based on the animated series Star Wars: The Clone Wars and even LEGO Star Wars figures. Undoubtedly with the new batch of films coming up in a few years, there will be ornaments based on those as well. Beginning with 2007, Hallmark had branched out with special, limited edition Star Wars ornaments that were only on sale on premiere weekends. Many of these ornaments, the first being the Tusken Raider, are highly sought after collectibles. But Hallmark raised the ante recently with extra rare, limited ornaments that were only available in conventions. Many of these special ornaments were basically repaints of previously released ornaments such as the K-3PO/R3PO and R2-Q5/R2-A3 sets being C-3PO and R2-D2 painted in different colors. However, Hallmark also put out original ornaments in these conventions of the nefarious bounty hunters IG-88, Dengar, 4-LOM and Zuckuss, as well as Ben Kenobi and Ponda Baba (that alien whose arm got lopped off by Kenobi in the Cantina). All of these extra rare ornaments are hard to find and command a lot of money in the secondary markets. Obi-Wan Kenobi riding on Boga, that agile dinosaur-like creature with the funky honks seen in Episode III. A diorama featuring Han Solo, Luke Skywalker, Princess Leia and Chewbacca in the trash compactor, and have a feature where the chamber starts to compress! A diorama featuring the Episode II arena battle with the huge beasts. Mace Windu with his purple lightsaber. Watto, who would look at home suspended on a tree branch. The bug-like droidekas seen throughout the prequel films. The MagnaGuards that accompany General Grievous, complete with their buzzing electrostaffs. Admiral Ackbar the Mon Calamari military leader who commanded the Rebels in Return Of the Jedi. A diorama featuring Luke on Dagobah with Yoda and a force ghost of Ben Kenobi. A diorama taking place in Jabba’s palace during Return Of The Jedi. The Y-wing, A-wing and B-wing fighters seen in Episodes IV-VI. It would be really cool if the B-wing fighter’s wings would open and close. Obi-Wan Kenobi’s Jedi starfighter seen in Episode II. They can even have one with the portable hyper space engines. The Mon Calamari cruisers seen in Return Of The Jedi. The Medical Frigate seen in The Empire Strikes Back and Return Of The Jedi. A speeder bike complete with a scout trooper. It would blend in nicely on a Christmas tree since they were shown in Endor’s forests. A Bespin twin cloud car from The Empire Strikes Back. Jabba the Hutt’s sail barge from Return Of The Jedi. Anakin Skywalker’s pod racer from Episode I. The Hallmark ornaments for this year just made their debut yet the company already announced some of 2013’s ornaments in the San Diego Comic-Con. Many of them look like must-haves for collectors and fans. The U.S.S. Kelvin seen in the 2009 Star Trek reboot is the latest in Hallmark’s long line of Star Trek ship ornaments. It looks well detailed as their ship ornaments often are, but no details have been revealed on any special features. As with the other Star Trek ship ornaments, the Kelvin will light up. After years of demands from vocal fans, Hallmark will finally produce a Scotty ornament. This one will be the fourth in the series “Legends Of Star Trek“. Reportedly, the ornaments in this series can be placed together to make up a scene from the show. 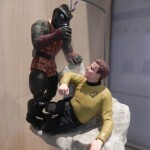 The coolest looking ornament is a mini diorama featuring Captain Kirk fighting with the reptilian Gorn (seen in the classic Star Trek episode “Arena”). It will feature dialogue from that episode and that exciting vintage Star Trek fight music (hopefully they pick the right score!). If only they included those iconic mountain formations too or Kirk’s handmade cannon! To celebrate the 30th anniversary of Star Wars Episode VI: The Return Of The Jedi, Hallmark will produce several Star Wars ornaments that reflect that film. 2013’s Star Wars ship ornament will actually be of the two-legged scout walker that was shown prominently in Return Of The Jedi. 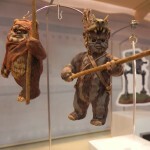 Additionally, a set of two Ewok ornaments will be available next year, one of which is Wicket who, of course, appeared in Return Of The Jedi. A limited editon ornament coming out in July will be of Boushh, but a super rare ornament of the rancor will be available in the 2013 Comic-Con. 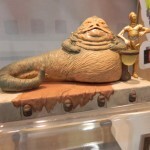 The highlight of the Star Wars ornaments will be Jabba the Hutt. On the base of the sluggish gangster is C-3PO. Other ornaments in the series will include a Lego Yoda and Jango Fett in flight mode. The usual superhero ornaments were announced at the convention. 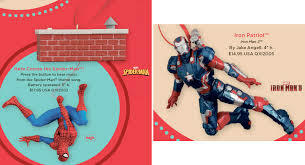 Look for a Spider-Man ornament that plays the ’60s theme song, an Iron Patriot ornament based on Iron Man 3 and several based on Batman. One of which will be the Adam West version of the Caped Crusader which could be the surprise hit of 2013. Other Batman ornaments will have him on the batpod as seen in The Dark Knight films, which will be limited, and the deadly flying batwing aircraft seen in The Dark Knight Rises. There will also be a Joker ornament based on Heath Ledger’s interpretation in The Dark Knight. The only other superhero shown in their display was Superman in a wimpy flying pose, based on Man Of Steel. Also look for ornaments based on The Hobbit, Harry Potter and believe it or not K.I.T.T the car from Knight Rider. UPDATE **** We just learned that the Bat ornament from The Dark Knight Rises will be a limited edition ornament to be released for the 2012 Holiday season. Happy hunting! Also, some sad news for some but the Adam West Batman ornament has been pulled from this year’s offerings. Hey Hasbro, Make These Star Wars Toys! Here’s GEO’s Cool Pick of the Week. Vintage World War II-era Star Wars toys! I came across this website while searching online for Adam Hughes’ art (BTW I just found out that some of my fellow Starloggers’ articles are popping up on the first page of a Google search, way to go!) and these toys just captivated me. I am really intrigued by this concept created by a toy enthusiast known only as Sillof. 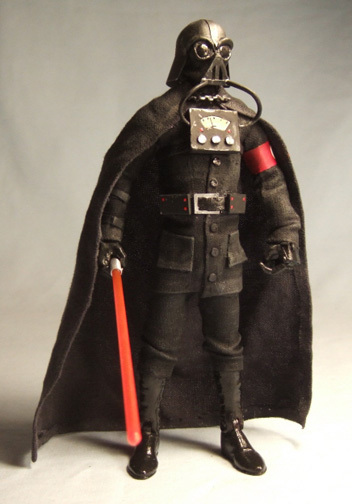 These toys are mockups from other toys that are remade into our favorite Star Wars characters as World War II/1930s-era figures. They’re really cool and a retcon of George Lucas’ saga. See much of Star Wars was inspired by the old pulp movie serials like Flash Gordon that played during the 1930s. But naturally, he updated the look of the characters to be more appealing to today’s audiences and it worked. With these toys, any fan can see the influences much more easily and it is a truly imaginative concept. What if Star Wars had been a movie serial from that era? 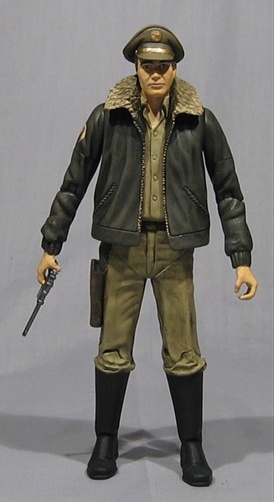 My favorite character in this line is Han Solo with his bomber jacket because this toy figure keeps the essence of Han Solo and easily transplants him into the era. I thought the Darth Vader re-imagining was perfect with his stylized gas mask and his chest piece is just awesome. As for Chewbacca, while he looks more human it does illustrate how the wookie would’ve been executed by Hollywood in those days. Chewbacca reminded me of the Wolf Man makeup as worn by Lon Chaney, Jr. The website links to Sillof’s website where other creative figures are showcased such as Star Wars re-imagined as a western and a medieval fantasy. They’re worth a look and made this fan, who’s a bit burned out on the regular Star Wars toy line , take notice. They’re not on sale but Hasbro and Lucasfilm should seriously consider commissioning a line like this, at least on a trial basis. I’ll bet they would be very popular. Sure it’s after Christmas, but for us fans of Hallmark ornaments it’s a fun or frustrating time (depending on how successful you are in hunting) for bargains as genre-based ornaments go on sale for half off or more. As we’re busy gobbling up 2011’s ornaments, let’s look ahead to this year’s ornaments. Most of them will go on sale sometime in July with the rest coming out in October. Incidentally, the full lineup of Hallmark ornaments won’t be officially revealed until this spring. But for now here are the known 2012 ornaments based on cool stuff we like. In other words, this ain’t about fuzzy elves or reindeer! To celebrate the 25th anniversary of Star Trek: The Next Generation, Hallmark is releasing this replica of Captain Picard’s Enterprise. Collectors will know that this ship was produced in 1993. The difference between these two is that this one can be displayed on a stand (similar to Hallmark’s 2006 version of the original Enterprise) and is battery operated. Presumably it will feature lights and sounds; hopefully Jerry Goldsmith’s majestic score will also play when a button is pushed. The third in the Legends of Star Trek series. This figure of everyone’s favorite Starfleet doctor is a companion piece to the other entries in the series, Kirk and Spock. Not sure what is the official title of this diorama. 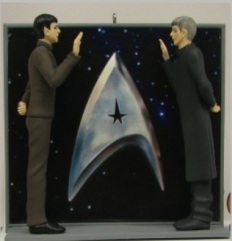 It’s a recreation of sorts (without the Star Trek delta shield logo in the background) of that scene near the end of the 2009 Star Trek film where the old Spock from the real universe meets his younger alternate self. 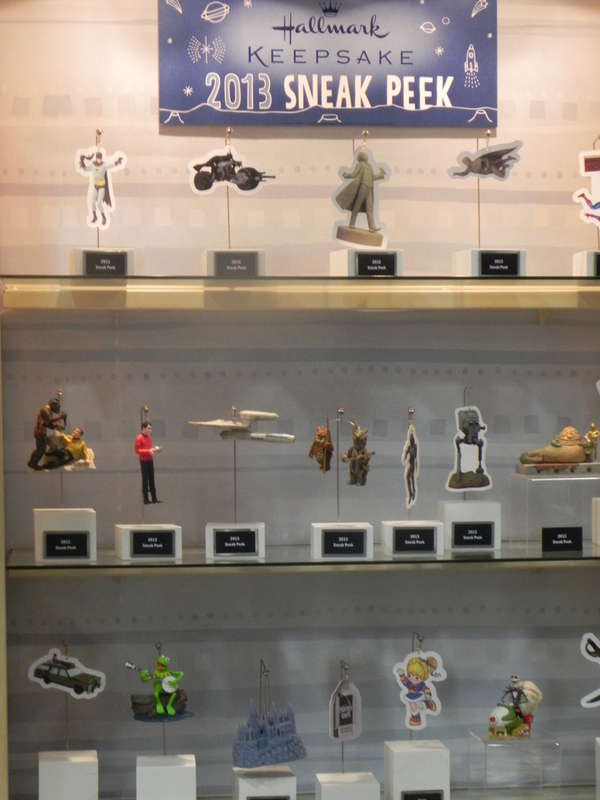 Barely glimpsed in Return of the Jedi (but that’s nothing new when it comes to Star Wars merchandise), nonetheless it will be beautifully detailed as are most Hallmark ship ornaments. 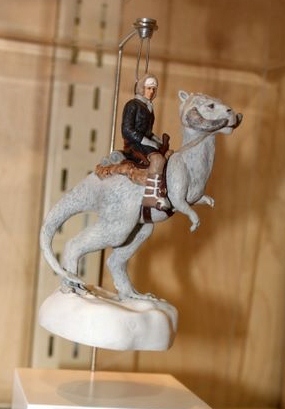 From The Empire Strikes Back, Han sporting his winter duds on his soon-to-be doomed riding animal. For any non-fan, the animal is a tauntaun used as beasts of burden by rebel soldiers and personnel on the frozen world of Hoth. Han took this animal out at night to look for his friend Luke who…oh never mind, it looks neat! Trust me it will make a solid gift for a Star Wars fan and it won’t cost a lot either, probably selling for less than $20. Then again from looking at the fact that the ornament has a base which would fit batteries it could mean the price could be jacked up. But it’s still a good gift! As a fan of this character from Revenge of the Sith and The Clone Wars cartoon, I’ve been hoping they would release this Jedi slayer, which if you’re into the villains of the movies, make a great addition to that collection or on your tree. (A fan can geek out by putting all the Star Wars villains together in one spot!) The cape and lightsabre are a nice touch. Too bad they didn’t have him with all four arms extended, but that would probably make the ornament even more fragile. Future editions can feature his raspy voice. This is Maul’s second ornament, the first one was released in 2000 a year after The Phantom Menace came out. Fortunately, the pose is different in this year’s model and not a re-issue with a new paint job. Those kinds of ornaments are reserved for convention to go on sale in the secondary markets for obscene amounts of money. Hot on the heels of the successful Lego Darth Vader ornament comes this one of the white-clad cannon fodder. Perhaps Lego droids or Yoda are up for 2013. Please visit our website to continue reading this article!